Ocensa is a Colombian Pipeline company who owns and operates a crude oil pipeline that runs from the Cusiana and Cupiagua fields in the Llanos basin to the port of Coveñas on the Caribbean coast. The 830km pipeline has a capacity of 600,000b/d, accounting for around 60% of total Colombia crude oil production. It was founded in 1995 and it is headquartered in Bogota, Colombia. 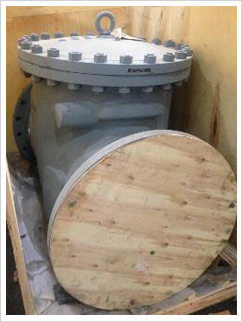 Pressure Seal globe valve 3"
Pressure Seal globe valve 4"
Pressure Seal globe valve 12"
Gate valve Pressure Seal 3"
Gate valve Pressure Seal 4"
Gate valve Pressure Seal 8"
Gate valve Pressure Seal 2"
Gate valve LP 14 "
4 (EA) Zona Franca, Barranquilla, Colombia. In 2014, OCENSA started an expansion project called Power 135 ( P135) with the main goal of increasing the capacity of the system. During the execution, the company reviewed and optimized the CAPEX of the project and therefore some equipment (including long term items), Booster Pumps, valves, turbines, engines already acquired by the project were not installed. All equipment is brand new, stored and preserved according to manufacturers’ specifications, and available immediately.